We welcome two pets per apartment home. $300 pet deposit for 1 pet, $400 pet deposit for 2 pets. $200 non-refundable pet fee for 1 pet, $300 non-refundable pet fee for 2 pets. $30 monthly pet rent for 1 pet, $40 monthly pet rent for 2 pets. Breed restrictions apply. Please call our leasing office for more details. Parking Comment: We have covered parking, garages and open parking. $50 for carports and open parking, $125 for detached garages and $175 on attached garages. 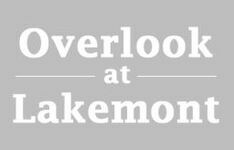 Overlook at Lakemont is home to a host of amenities that make our residents happy every day! The central hub of our community is the stylish resident clubhouse where neighbors get to know each other while unwinding around the welcoming fireplace or playing a rousing game of foosball. For fitness enthusiasts, Overlook at Lakemont has everything you need to get in and stay in shape. The exercise center is bright and modern and filled with free weight and machine options. The big screen TV is a great distraction to make your workout time just fly by! Speaking of time, the fitness center is open to residents twenty-four hours a day. For your ultimate relaxation, take some time to lounge around the resort-style pool and spa area. Clusters of outdoor furniture create conversation areas where you can enjoy the shade of the covered patio area and the lovely wisteria-covered arbor. The picnic and barbecue area is a hot spot for gatherings, and the children’s play area is a popular with all ages. Your on-site management and maintenance teams are eager to serve and can help with emergency maintenance needs, setting up electronic payments, wireless internet access, and other services available in the resident business center. We understand that your pet is family, and we want your whole family to be happy here at Overlook at Lakemont! Our proximity to Lakemont Park and all of the walking, jogging, bicycling trails in the neighborhood make for a great place to live with your canine best buddy. You can get out and get some exercise, go for a romp in the open grassy spaces, and have a game of fetch! If your best friend is of a feline nature, then all the warm sun shining in through the great windows of your new apartment home is just the ticket to a very happy cat!